This is extravagant living at its best. Picture yourself enjoying expansive water views and majestic sunsets. The park like setting lends itself to an idyllic outdoor paradise. This home has 7 huge bedrooms and 5 palatial bathrooms. The house boasts a wide-open floor plan with soaring cathedral ceilings, lots of skylights throughout and huge glass windows throughout the house to see this amazing water view. The open floor plan space allows you to socialize and entertain your friends in grandeur style. Dine indoors or out overlooking this majestic waterfront. This home is located on 2 waterfront acres in the town of Southampton. A tranquil feeling will encompass you as you look into the large koi pond stocked with goldfish in a designer showcase garden filled with luscious wildflowers and berries. Stroll along the water watching the most glorious sunsets. BBQ by the water, or sun yourself on either of the 4 decks on the property. The house has an Olympic size heated pool and 8 person hot tub/spa. This home comes fully equipped with a mass of dining and entertaining plates, platters and utensils. Two blenders are available to make all your little umbrella drinks. Designer linens and tons of towels complete the amenities. Additional pool towels are provided. Central air makes indoor living very comfortable. Every bedroom is equipped with a 42” inch plasma television and DVD player. Master bedroom has a large PLASMA television. 50” TV in Living Room. The house has Cd player, Stereo and wifi, IPOD dock & Satellite radio completes your entertainment package. This home is centrally located and is just minutes from the ocean. The outdoor gazebo (overlooking the pool) is enclosed allowing warm breezes in and leaving bugs out. You can also dine inside the gazebo. Watch beautiful sunset evening after evening at this residence aptly named “Watersview” with 2 acres of unobstructed views of enviable scenery from almost every room. Tons of designer towels are provided for both bath and pool. Grab yourself a little piece of joy. Stay here and love it like we did! But not during the 2 weeks we're grabbing for next year. I'm booking early! I couldn't be happier with this fabulous property! It had everything I could ever want and then some--great views, huge bedrooms, great outdoor setting with an outdoor kitchen with fridge, cooler and ice maker! We were provided with top quality linens, tons of bath and pool towels, etc. We felt like the royal family! This is the first time that my family and I rented in the Hamptons. When we arrived at this beautiful house we were amazed but how remarkable the house was. One could tell that the house was very well maintained. The bedrooms in the house were enormous. It was nice that almost every bedroom had its own bathroom. The best part of this exquisite house was the outdoors. 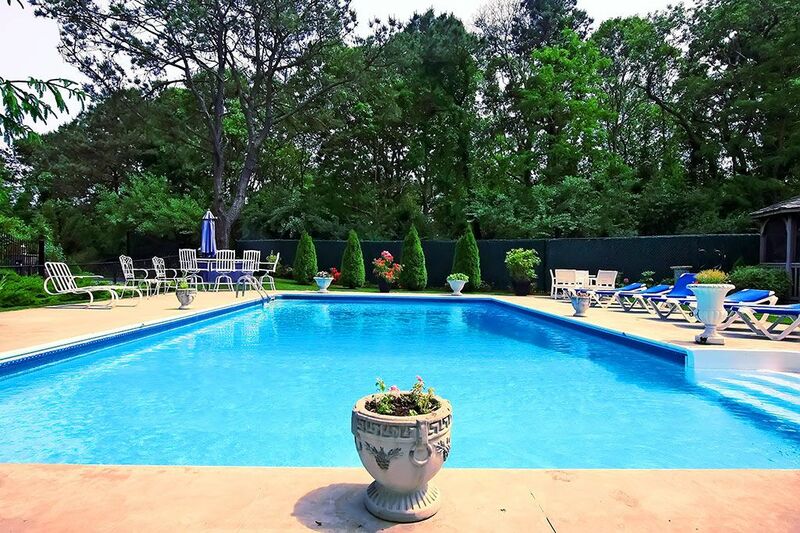 When you walk into the backyard you are welcomed by a sparkling blue pool. My family spent almost all their time sitting by the pool soaking up the sun and then jumping into the hot tub. At night the wonderful outdoor kitchen got a lot of use when we decided to have a BBQ. It was extremely convenient to have a wine cooler, ice maker and mini fridge outside instead of having to go into the house every time we needed something. Michelle and Marilyn were very professional and a delight to work with. We are so excited that we get to come back next year for our yearly family reunion. I would highly recommend this house to anyone who is looking to get a taste of paradise at a sensible rate. What a fabulous review. Thank you so very much. It was indeed a pleasure having you and your family stay at Watersview. We look forward to welcoming you back next summer. The house has been reserved for you. Kindest regards, Marilyn, hamptonhouseproperties. My family and I rented this house this summer and it was unequivocally stunning. We spent most of our time outside at the pool. We loved how large the property was and really loved how huge all the bedrooms were. A bonus about this house for my family was how many bedrooms had their own bathrooms attached. We also really loved the full outdoor kitchen. The house came with designer everything from sheets to towels. This house was cleaned very well prior to us moving in. The family really loved sitting on the back deck and watching the most breathtaking sunsets. This home is amazing and the view is priceless. For what this house has to offer and at the price it’s the best act in town. This home was absolutely perfect. Everything we needed, hoped for and or wished for was there. Lots of restaurants nearby, very close to all the best wineries and minutes from the beach. The house had beautiful landscaped grounds, lots of outdoor seating and tons of lounge chairs with grill and outdoor kitchen complete with fridge, wine cooler and separate ice maker…extraordinary is an understatement to say the least. Absolutely loved this house, location and grounds. Private estate directly on the water, yet just minutes away from golf, tennis and ocean.